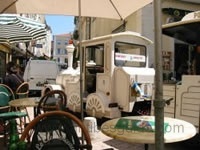 Attractions in Antibes - so much to see & do! The 16th century star-shaped fortress stands high on a peninsular with wonderful views over Port Vauban and Antibes. Even though the fortress is only open for guided tours there is a nice walk around the fort. It is open for guided tours only which are every 30 minutes summer 10:00 - 18:00 winter 10:00 - 16:30 every day except Mondays and public holidays. Take the train to Biot (one stop from Antibes) and spend a family day at Marineland and Aquasplash. Marineland is the largest marine attraction in Europe and is host to the annual Festival Mondial de l'Image Sous Marine (Underwater Images competition). Dolphins, orca, sea-lions and other sea life with daily shows. Open every day of the year with 2-3 shows daily (depending on the season). Aquasplash has several pools, 13 waterslides including the Black Cannon (the fastest waterslide in France), a wave pool and many other attractions. There are snack bars and a shop. Opposite Marineland is Antibesland ammusement park (on the Route de Biot). Great fun for adults and children alike. Leaves from place des Martyrs de la Résistance and winds through the narrow streets of Old Antibes, passing the Provencal market, Port Vauban and continuing to Juan les Pins. A sub-aqua view of the sea around the Cap d'Antibes, via a glass-bottomed boat. Departs from Ponton Courbet, bd Guillaumont (near the Juan le Pins tourist office), and travels around to the southern tip of Cap d'Antibes before returning to Juan les Pins. Trip time approx. 1 hour. Cost €12 children €6 Operates from April to September. More information from Le Visiobulle website. Combined tickets are available from the tourist office for the museums and Fort Carré. Housed in the Château Grimaldi on the ramparts above the port is one of the greatest Picasso collections. Picasso spent 1946 painting here and gave the museum all the work he'd done here: 24 paintings, 80 pieces of ceramics, 44 drawings, 32 lithographs, 11 oils on paper, 2 sculptures, and 5 tapestries. As well as Picasso's works a gallery of contemporary art also exhibits the art of Léger, Joan Miró, Ernst, and Calder. An authentic Provençal covered market in the heart of Antibes. Fresh fruit, vegetables and flowers every morning (except Mondays in winter). Arts and crafts from 15:00. Easter to September every afternoon except Mondays. September to Easter Friday & Sunday afternoons. Place Jacques Audiberti, between the Porte Marine and the Place Massena.